How do I start? Many people wrestle with this question after deciding they want to transform their existing yard into a native plant garden. When Susan and Jim Graham first made that decision they described their existing yard as “ mostly turf grass with an azalea mustache;” a look typical of many of the landscapes routinely installed in new developments. Of course there are many ways to start a native transformation, and choices are defined by considerations such as budgets, timelines, and ability or desire to do the actual work oneself. This is the story of one couple who solved the puzzle and created a beautiful and functional new space. A sterile, resource-gobbling lawn transformed into a beautiful yard that attracts birds and butterflies! 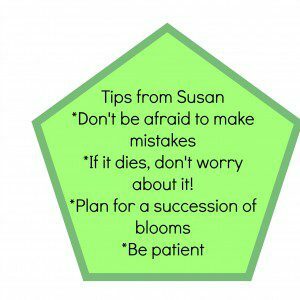 Susan had been learning a bit about native plants and their benefits from a Master Gardener course she was taking, especially from a segment on natives given by a member of the Virginia Native Plant Society. She decided that she wanted to transform her yard, and that her first goal would to reduce the size of the lawn. 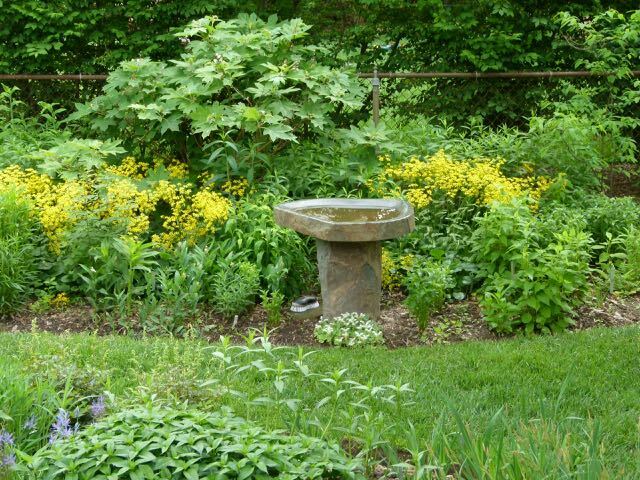 She picked up a book for some guidance and found ideas that sparked her interest in The Perennial Gardener’s Design Primer, by Stephanie Cohen and Nancy Ondra. 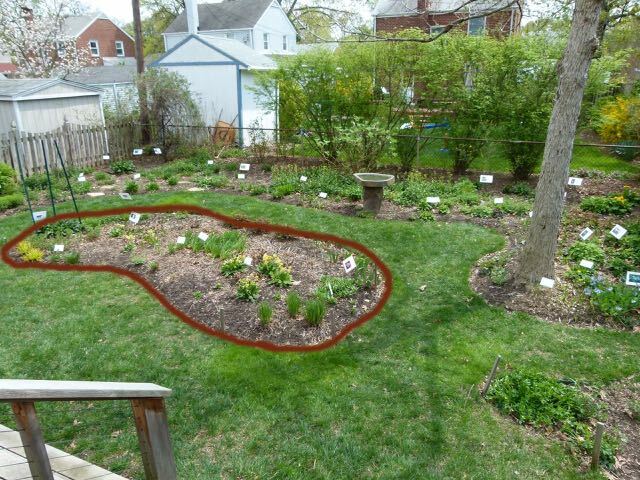 For their first step, Susan and Jim chose a spot in the middle of the back yard where they defined a kidney-shaped area as the site of the first new planting of natives. Susan described it as being “like a little rug.’ This new form did two things. It gave definition to the space, and provided functionality: both the wheelbarrow and the mower could be used as aids in the maintenance of each space. Red line indicates the starting point for the transformation; the first bed created. Since they were not in a hurry, Susan and Jim were willing to do much of the labor themselves. So to kill the turf, they covered the grass they no longer wanted with layers of newspapers topped with mulch. Then they left town for most of the summer. That worked! When they returned, the turf was dead and the new area was ready to plant. For that first bed, Jim make the supreme effort of double digging to ensure optimal success, an effort they later discovered they would not to repeat. 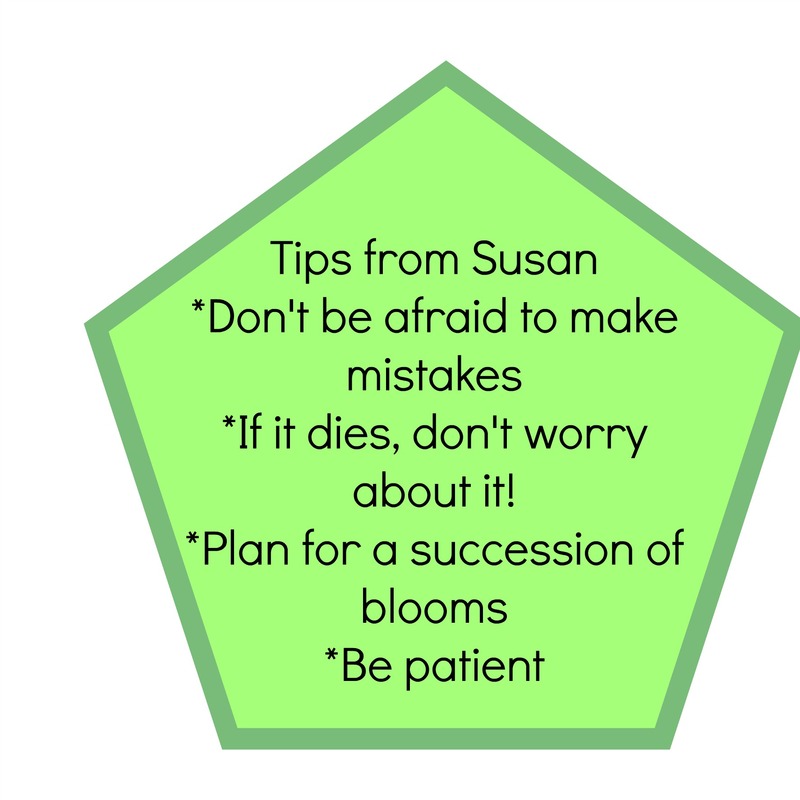 Using suggestions from the Primer’s authors, Susan was careful to choose a palette of plants that all had the same requirements for light and water. The preparation and planning paid off; the new plants exploded into life. Although they watered faithfully to get the plants established, by the second year, no supplemental watering was needed. As time went by, the rug grew and the grass ring shrank, until the surrounding strip of lawn was just wide enough to accommodate their mower and not an inch more. 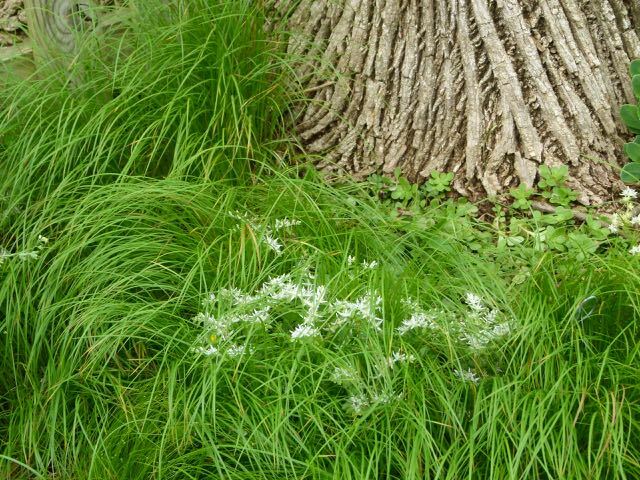 Beneath both oak and ash trees, Susan found it easy to insert small slips of the wonderful grass substitute, Pennsylvania sedge, (Carex pensylvanica) which eventually spread to form a thick carpet. ♦ form a stake and loop out of 16 guage solid wire and attach the new label. These homemade labels save money and will not fade in the weather. After the success of the first area, Susan and Jim began to expand their planting beds a little at a at a time until both the front and back were completely transformed. They bought plants online, shopped at local sources, networked with friends, and attended native plant sales. As the new beds grew, the Grahams wanted to incorporate curving lines to make a pleasing design, but they were careful to make sure the curves arose organically from existing features. The overall effect is a unified and harmonious space. A shed line’s were softened with a circular trellis that functions as a home for a coral honey suckle vine that hosted an entire family of cardinals one year. They splurged a bit on a special bird bath to enhance the back fence line. 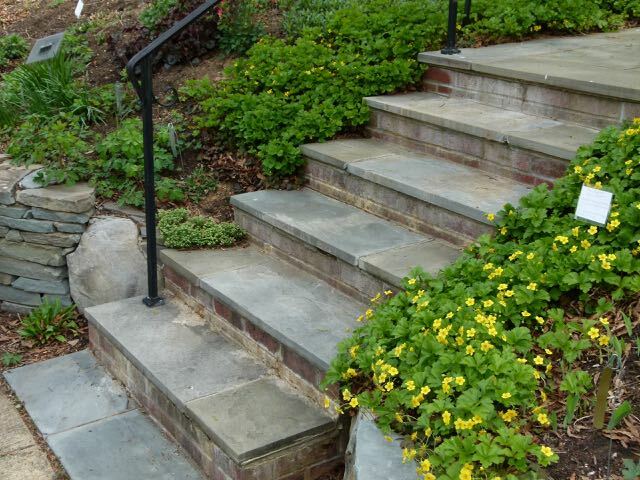 Barren strawberry, (Geum fragarioides), softens the framework of the steps and gives a warm welcome to guests. 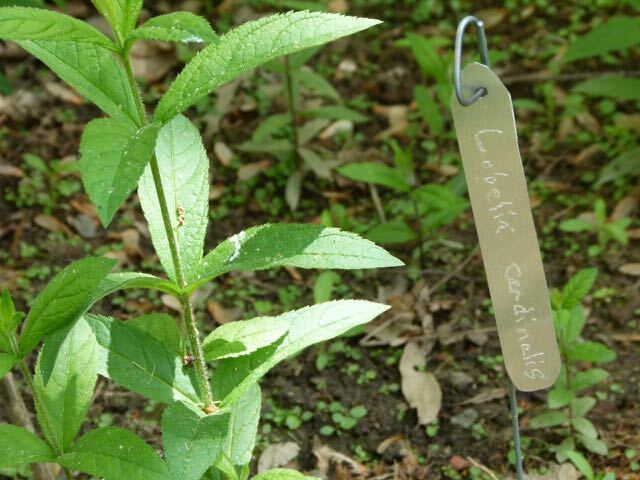 This past spring, their garden was featured was on a Native Plant Tour held by the VNPS. 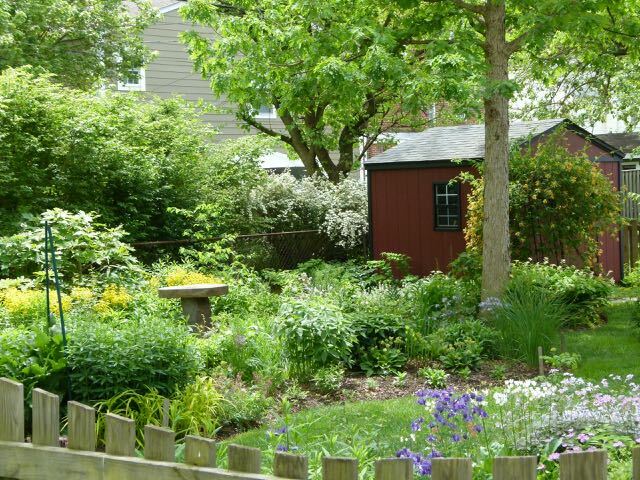 Thanks Jim and Susan, for sharing your garden in so many ways!